"Did you already visit the region or is it your maiden trip? Make sure you do your homework before you leave. We can assist you with some guidelines, but remember that your personal taste is the determining factor to choose the region you want to visit." When people say they like champagne and you ask them “which one?” you usually get no answer to this question. This is nevertheless an important question every oenotourist must reflect on before organizing his trip to the Champagne region. Do you prefer fruity, floral perfumes or acid, light, mineral bubbles? Or do you prefer to drink champagnes with length and backbone? The three primary grapes used in the production of most champagnes, give the bubbles their own characteristics. 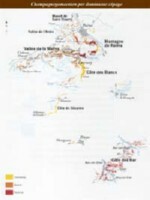 There are approximately the same amount of vineyards with Pinot Meunier, Pinot Noir or Chardonnay grapes, but they are spread all over the region. Pinot Meunier, responsible for the fruitiness, is mainly cultivated in the ‘Vallée de la Marne’. Pinot Noir, which provides backbone and structure, is predominantly grown on the ‘Montagne de Reims’ and in the southern Aube-region. The best Chardonnay grapes, delivering the elegant, mineral bubbles, ripen on the slopes of the Côte des Blancs. This does not impede winegrowers of the ‘Montagne de Reims’ from producing their own Blanc de Blancs. They’ll probably work mainly with Pinot Noir grapes, but they will also use a percentage of Pinot Meunier and Chardonnay in their different cuvées. 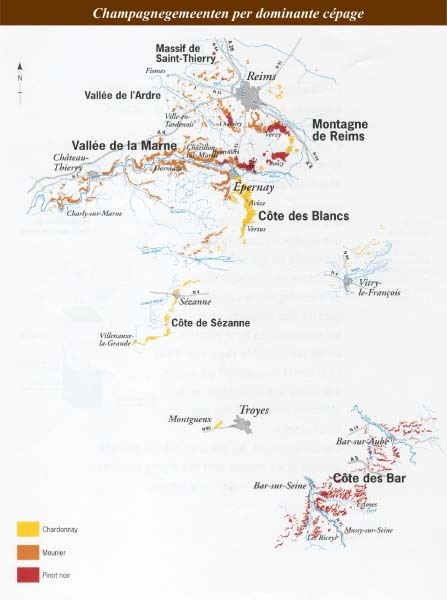 Most producers in the Côte des Blancs, on the other hand, will only use their precious Chardonnay grapes in their cuvées. You can not map out your route until you know which champagne you want to discover.